Do you have a prayer list? I’ve shared the template for my monthly family prayer list before. I also keep a list of current requests for other family, friends, or needs that I want to talk to God about. Most of the time when you and I pray, we have an outcome we want to see. It may be that someone gets well, that God opens a door, closes a door, mends a broken relationship, or meets a financial need. The list could go on and on. As I was reading R.A. Torrey’s book How to Pray, the following line stuck with me. So as we bring every concern, fear, hope, and desire to God in prayer, beyond all else, we should want God to be glorified. If we have a self-centered purpose or wrong motive behind our request, it is highly likely that our prayer will not be answered. Remember what James 4:3 says? In every request I make, my main desire should be that – no matter how God chooses to answer – He will be glorified. What’s sometimes hard to accept is that God may be glorified by allowing us to continue in our trial, our sickness, our financial trouble, or dealing with our difficult child. In our humanity, we don’t know the outcome that will bring the most glory to God. We have to trust that God will accomplish that goal as we surrender to Him. Here’s a personal example. Our 18-year-old daughter will be heading to college in August. This month I started specifically praying for her roommates. I’m asking that God will put in her room girls that she can become good friends with. I’m praying that they will get along, and that she’ll make many happy memories with these girls during her freshman year. But I have to admit that God, knowing what is best, could potentially give her a roommate that’s hard to get along with. Maybe their personalities will clash. Perhaps one of the girls will disturb everyone else by staying up super late or being noisy when she gets up early. Maybe God would be glorified by my daughter learning to live with a difficult person. Perhaps God knows she’ll experience more growth if she has to deal with some frustration. Will that be easy for her (or her mom)? No. But I need to understand that whatever the outcome of the roommate situation, the ultimate purpose is that God would be glorified. So maybe we need to say it out loud or write it in colored ink at the top of our prayer list. Lord, as you hear the requests I make, may You be glorified in every answer. Does My Prayer Request Pass These Tests? Such an interesting post on prayer! R.A. Torrey’s view of prayer is certainly not what we first think about when it comes to “asking and receiving” from the Lord! Thank you for this insight! I know I’m typically more focused on getting the answer I want/need from God than I am on how He will most be glorified. Hope to remember to take this view more often from now on!! 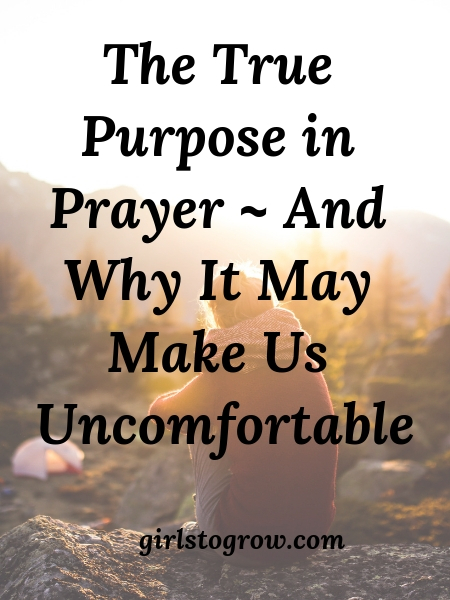 I hadn’t thought of that as being the true purpose of prayer, but it certainly is. Everything we do should glorify God and prayer isn’t any different. Thank you for posting that quote and your thoughts about it. I’m going to have to remember this when I pray. It certainly does to have the potential to be uncomfortable!! I’m reminded that it circles back to trusting God, especially when an answer to prayer seems delayed or isn’t the answer we’d hoped for.